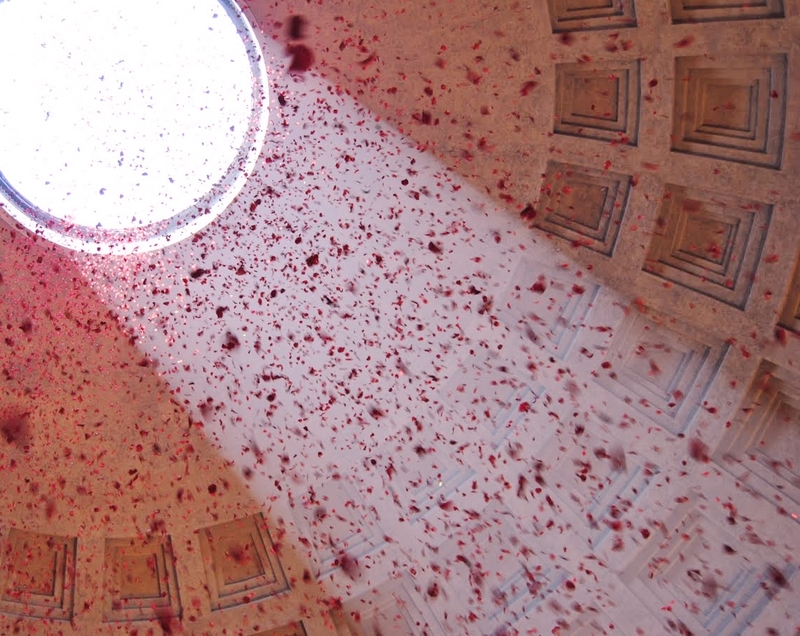 Veni Creator Spiritus | The Mass for Pentecost | Shower of Roses, Pantheon – Rome. There are many comings and goings in life. Each brings its joys and sorrows, and is an experience of receiving, or of loss. There is the coming of love in a romance, the coming of oneness in love and consecration, the coming of children in oneness of love; the coming of friends into lives; the coming of knowledge in study; the coming of fear in suffering, of pain in separation. We welcome many of these comings and naturally fear the others. Woven together, each coming becomes an opportunity for growth, and from them all lives are shaped, and offered. The goings are another story. What happens when romances end, children rebel and go away; when friends are lost or distance separates them; when marriages fail, consecrations end in betrayal; when disappointments set in and commitments once held strongly dissipate; when disease weakens the body, when human weakness reveals itself stronger than the will to surmount it; when life dies? Are these losses not worth the initial investment of love? Are they a waste? If all this receiving and loss is natural to human existence, it makes sense that the same pattern exists in the revelations we have of the coming and going of God among us. And so it is that the sending, the coming and the going of Christ, of God incarnate– all of which is modeled on giving and receiving– shapes the life of each person created in His image. The life of Christ is a litany of coming and going, of giving and receiving that bespeaks a generous love; a love that desires union. We start with the sending of the prophets, the sending of Gabriel to Mary, the coming of the Son as a helpless infant among men, the sending of the Baptist as the foreteller of the coming kingdom. Then there is the coming of the ‘hour’ at Cana in Galilee; the going to the desert to pray and there be tempted, the going to the woman at the well in Jericho, the going to Tabor to reveal His glory, the ‘late’ going to the grieving Mary and Martha, and the raising of his friend Lazarus. We follow the going into Jerusalem, the going to Gethsemane to drink of the chalice of suffering, the going to Calvary. Then there is His coming to life by rising from the dead; His coming to the Magdalen who wept in the garden, coming to Thomas who doubted, and the apostles who feared. And we then receive from Him the promise that in going to the Father, He would send an ‘Advocate’ who would remain with us until the end of time. No part of this narrative, and all the gaps within it, makes sense outside the parameters of a generous and unitive love. In this way, it is no different in nature from our human experience of love in receiving, and in loss. We ask ourselves often, was it worth it? Was all the love worth it when the romance ends, when the friends separate? What is the point of life that is often difficult, painful? Why is there suffering? Is the offering of my time and interests worth this life-long commitment to a spouse? Will sacrificing my ambitions, career, family, be worth it if I offer my life to God in consecration? We ask these questions ourselves, as if having given ourselves what we have, we fear it will all be a loss, a waste. Our friends ask these questions of us. Sometimes our culture, in its endless search for novelty and aimless fulfillment, poses them to us indirectly, yet all too personally. In each of these instances an ever modern calculation takes place, which we often sum up on the side of the known, the comfortable, the instinctive capacity for limited offering, because anything else would be too great, too difficult, too daring, too total. When Christ came among men, there were no such pre-calculations of usefulness or worthiness; there was simply the desire for oneness. The cost, however great, was not a factor. And it turned out to be a great cost, for redemption from sin had a hefty price, and it was paid in the full offering on One life, such that every question ever asked relating to worth, and cost, and offering, could then be judged in light of the going of God among men, of the sending of His only Son, of the total consecration of His life, and the offering of that life in the fullest way. Nothing was held back on our account. No half measures were taken. There has been, and continues to be total offering, total sacrifice, total love, total gift, continued coming, endless promise of union, oneness in suffering, betrayal, rejection; and after that, still promise of union, still giving of sevenfold gifts in the Spirit—because God who is One, cannot bear separation, and so showers abundance, in hope of a response from us, of our union in return. And I will ask the Father, and he will give you another Advocate to be with you always, the Spirit of truth, which the world cannot accept, because it neither sees nor knows it. But you know it, because it remains with you, and will be in you. In a little while the world will no longer see me, but you will see me, because I live and you will live. How daring of Christ to later tell the ones who had been with him, had seen him die and rise, ‘It is better for you that I go.’ (cf. John 16.7). In the ordinary human exchange that must have taken place on hearing those words, the pain of separation, of this particular going, must have been felt strongly. ’Grief filled their hearts.’ But received alongside the words Christ gives his disciples above, this was not abandonment to nothingness, nor some meaningless order of words uttered to no consequence. The showering of the Holy Spirit, of the promised Advocate at Pentecost, infused in the apostles the capacity for a greater union and greater courage. It gave them understanding of the promises of Christ, prudence and wisdom, comfort in the persecutions and sufferings that followed, knowledge of the truth, unity in discord, piety in worship and faith in the offering of a new and lasting sacrifice, in memoriam. All this was nourishment in abundance for a nascent church, of which Christ is the head, the beginning, the sustenance, the end; a church He remains alive in. But it did not end there in the upper room, with the ‘tongues as of fire’ coming on the apostles and the Mother of Jesus. For that outpouring that gave birth to the Church gave her also the fruitfulness of children; spiritual offspring won from the incarnate offering of Christ. -‘Love Divine All Loves Excelling,’ Wesley.